This luxurious beachfront suite is situated directly on a gorgeous half-mile beach called Sapphire Beach, the island's most beautiful beach. It features stunning views of St. John and the British Virgin Islands. 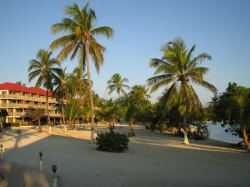 Step onto the pristine sand from the spacious patio, and jump into the sapphire blue water. There is outstanding snorkeling at your doorstep! Enjoy daily maid service, a fully-equipped kitchen, and a spacious living room and dining area, with a divider separating the king-size bed and queen-size sofa bed. Amenities include air-conditioning, cable television, and a ceiling fan. 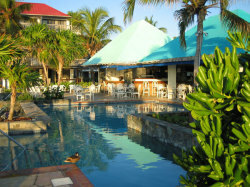 The resort features a watersports center, a large freshwater pool, tennis courts, hammocks, beach volleyball, and a marina with daily party and fishing boat trips to St. John and BVI. Our condo is near the town of Red Hook. And it's convenient to grocery shopping, dining, and ferry service to St. John and the BVI.